This entry was posted in Spadina Car, Transit. Bookmark the permalink. Tired of all these streetcar track re-construction over and over again. Didn’t we just do this last Fall? And last Summer too? And last Spring also? And pretty much every spring, summer, and fall since living memory? On College St I don’t mind too much but what bothers me is when we have these regular track re-constructions on streets with major hospitals. Have any studies been done on the number of deaths due to ambulance not making to the hospital in time thanks to streetcar track re-constructions? To that end, I don’t mind if we have streetcars on St Clair, College, Carleton, Gerrard St East, Kingston, Main, Spadina, King, or Eglinton but these must be banned on Queen, Dundas, and Bathurst to prevent delay and gridlock on streets with hospitals with emergency departments. I don’t oppose streetcars at all and in fact fully support new streetcar routes (both Downtown and suburban) but NOT on Hospital streets. Steve: Actually, the TTC and emergency services go to great lengths to avoid problems at hospitals. As far as I know, nobody has died because their ambulance was stuck in a track-related construction program. Can you say the same for the Gardiner Expressway or the 401? The last job beside a hospital was at Queen & Victoria, and I didn’t hear any problems from St. Mike’s whose emergency department is on Shuter Street, not Queen. Indeed there is more ongoing interference with traffic on Victoria street from various building projects, and an expansion of the hospital itself is about to join them. Your is a very selective anti-streetcar argument. Also, of course, the TTC does not dig up the same location every year. Spadina is just finishing up its intersections this year. With this newest TTC track work (the only one scheduled for this year), the TTC replaced streetcars on the “510 Spadina” route with shuttle buses for the next few weeks, beginning Sunday, March 29th. The main branch of the “510 Spadina” to “Union Station” via Queens Quay West isn’t in operation for this period, so service on the “509 Harbourfront” has been increased. This is reminiscent of 2012, when for much of that year buses ran on the “510 Spadina” route because of extensive construction on this route; they didn’t run on the main branch of the route via Queens Quay West; streetcars stuck around longer on the “509 Harbourfront” route, until mid-summer (shuttle buses took over on July 29). Later that year, streetcars returned to the “510 Spadina” route, going only as far south as King Street; shuttle buses were still running on Spadina between King Street and the Queens Quay & Spadina loop, until August 31, 2014. To get to Harbourfront Centre – me being somewhat of a diehard streetcar fan – would take a combination of the “511 Bathurst” and “509 Harbourfront” streetcars to and from there, which I was doing back in 2012. To speed up all the construction projects on the streetcar tracks, the remedy would be to hire more workers. Like they do in China, where if you fail to work, you get shipped out for “re-education”. Of course, the penny-pinchers would complain hiring more workers means more “gravy”, and we should be reducing the workforce. Hire more to speed up the construction, or reduce the workforce to “save” money? Which will it be? Steve: Actually, the way they do the work now uses fewer workers than in days of yore when the track wasn’t as well put together. They used to assemble every piece on site (occasionally discovering that things didn’t fit, or that they had mixed up some parts), do some very selective welding, and plunk the whole thing in concrete that would promptly disintegrate because there was no mechanical isolation between track and roadbed. Now the intersection is pre-assembled offsite and trucked in panels for easy delivery and installation. The usual pattern is that the first two+ days are needed to demolish the old intersection, then build the foundation slab (this step should not be required the next time the intersection is rebuilt). By about day five, the first of the track starts to go in and by the end of week two everything should be in place except some of the concrete work. The whole thing needs to cure for strength, and no amount of laboureres standing around watching it will change that interval. Three weeks is the standard shutdown now unless other utility work is happening at the same time that must be co-ordinated with the track replacement. Great scene! Lots of jobs for men except I don’t see “a guy with a gun” standing around “protecting” all those workers! I guess “paid duty” wasn’t around back then. Do you know why the 506 is diverting via Bay Street instead of McCaul Street? I would have thought McCaul would make more sense. Steve: There are no curves to turn south to west or east to north at Dundas and McCaul. It does not “make sense” to turn where it is impossible to do so. Eighty eight years ago. Great scene! Lots of jobs for men except I don’t see “a guy with a gun” standing around “protecting” all those workers! I guess “paid duty” wasn’t around back then. Everybody has a problem with cops making to the sunshine list but nobody complaints about TTC workers. Steve: Vastly more police are on the sunshine list than TTC operators and maintenance staff. The issue with paid duty is that, in many cases, this is work that can and should be done by less highly paid people, certainly not at over $60/hour. Eighty years, cops rarely or hardly used automobiles. They were foot patrols, bicycles, or horses. If they were on a foot patrol, it would have been very easy to direct what very, very little automobile there was. Mostly it would have been foot traffic. Regarding the traffic signals along Spadina, the main phase sequence I observe for most major intersections is: EW green, NS lefts/U green, and NS green. Sometimes I see either the North OR south through movement get an early green if one of the NS left/U phases have no calls. However, I have never seen the traffic lights skip the NS left/U phase altogether to start the NS transit green. Does anyone know if it’s true that if neither the NS left/U phases are called, the controller will activate both of the left/U phases anyways, when that extra time can be reallocated to the North-South through movements? I had assumed Dundas and Queen were fixed, unlike College, until I saw one of those intersections give an early green to one of the North or South general traffic approaches with one of the lefts. The thing is that I believe policing would be better if there were still more officers on foot and on bikes. Direct contact with the public, more involved, and with a radio could still be involved in enforcing many of the rules. They would also then be riding transit, and would likely be more interested in enforcing the rights of way. Radio and a camera would go a long way on the street. All too predictably, City News was out on the first day of construction, making a big deal out of the construction noise and interviewing local businesses. Any followup stories? Any kudos to the TTC for efficiently rebuilding the intersection? Of course not. There are no curves to turn south to west or east to north at Dundas and McCaul. It does not “make sense” to turn where it is impossible to do so. I’ve spent a loonngg time examining the track map (most current version here) but I’ve never understood the logic used to dictate if a corner is passable or not. Why ISN’T there a curve south to west or east to north at Dundas, McCaul? Why ARE there curves east to south and north to west at King, Dufferin? Why do King/Spadina, King/Bathurst, and Queen/Spadina have curves everywhere, but Queen/Bathurst has only 3 of the 8? The non/symmetrical ones also really confuse me (curves that are “one way”, i.e. Spadina and College has north to east but no West to South). I suspected that “two way” curves were for diversions and taking cars in and out of service, but some of them make no sense – What the heck are the south to east and west to north curves at Dundas, Spadina FOR?! Similarly I suspected the “one way” curves were for short turns, and in one case “close to home” this seems to be the case – the east to south Gerrard/Broadview curve is frequently used by short turning 505s. But what the heck is the west to north curve at Spadina, College for? I wouldn’t be nearly so curious about the “surplus curves” if there weren’t “missing curves” – like the ones that would currently serve a lot of use at McCaul and Dundas. And I suspect I’m either missing something or no one knows the answer, or it’s something trivial like “At one point, all the curves were used for one reason or another, and they’ve just stayed through time”. But boy oh boy, would I like to know! Steve: To understand a lot of the intersections, you have to look at the route map as it existed before the subway opened. There were many more routes, and some of them took a wandering route into the core area providing the same sort of “relief” to the streetcars on Yonge Street that we now talk about for the subway. Some routes served industrial areas that do not exist any more (e.g. King & Strachan area). A few missing curves were victims of steel shortages during WWII and they were never reinstated. Some “missing” curves would conflict with manholes that would be difficult to relocate. Specifically: Dundas and McCaul is a minor and very tight intersection. It has a pair of curves in the northeast quadrant and both northbound curves from the south quadrant. When the track on McCaul was originally laid out, Dundas as we now know it did not exist, and the track ran through from Queen to College. It was used by various routes that came west out of the core and then used McCaul to dodge further north. I don’t know of any route that was ever scheduled to use the curves at Dundas. (Track on “Agnes”, as that section of Dundas was then known, did not exist until 1916.) The TTC stopped using McCaul for the “College Tripper” in 1923, and it ran all the way from College down to Queen. King & Dufferin was once an extremely busy intersection. The track to the south serves Dufferin Loop which once had very heavy streetcar service for the CNE including cars that ran south from Queen. There are no curves in the southwest quadrant of Queen & Dufferin because of the grade. There is only one curve missing at King & Dufferin (south to west), and I suspect this has to do with the location of a manhole on the NW corner. There would not have been any regular route that would use such a curve anyhow. 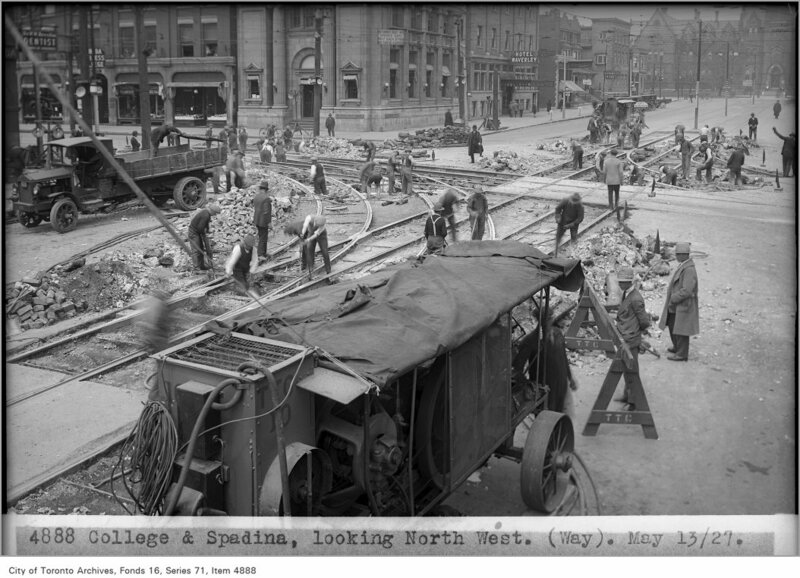 The Spadina intersections at Queen and King were deliberately built as grand unions for maximum flexibility. Bathurst & King originally was missing the SW quadrant, but this was added two rebuildings ago to provide a route between Exhibition Loop and Roncesvalles Carhouse. Queen & Bathurst is an offset intersection that would make some curves difficult. I don’t know why there is a S-to-W, but it was sufficiently important at one point that it had a warning light triggered by a contactor on the overhead to alert a following car that something had been around the curve in front of it. Charters made a point of using the curve to see if the light still worked. Spadina & College once had a S-to-E to match the W-to-N. That lone W-to-N simply does not make sense today. Why the TTC didn’t put the S-to-E back when the Spadina line was under construction in the mid 90’s or in the current rebuilding I do not know beyond suspecting that nobody thought to do this. When the Spadina line was first proposed, one option was to include a run around track on the north side of Spadina Crescent as a potential short turn for Carlton cars (instead of having to go to Bathurst Station). However, the UofT Earth Sciences Building was then under construction nearby, and they didn’t want any potential source of vibration, ergo no special work. As for the missing W-to-S curve, there has never been one there. Adding one now would, I think, run into a manhole. Spadina & Dundas: the curves in the northeast quadrant were used for years by the Harbord car and its predecessors. Harbord cars came west on Dundas, up Spadina to Harbord, and then west to Ossington. You can read the full route description elsewhere. Broadview & Gerrard: I believe that plans are to add the missing N-to-W for diversions when this intersection is rebuilt in 2016. Please note that I won’t answer any more questions in this vein until there is some indication that you have done more than look at a track map, notably reading through route histories to get a sense of how and why the system existed in the first half of the 20th century when a lot of the tracks and the routes they supported were installed. Some 510 cars from Russell used to use the west to north curve at Spadina to enter service. I don’t know if this had anything to do with the construction at the Don bridge and a desire by the TTC to avoid more congestion at Queen and Parliament by sending 510 cars in via Parliament and Carlton. Not to prolong the discussion on additional curves being desirable, Dennon might find this report to the Commission interesting. Thank you both to Steve and DavidC – My curiosity has definitely been addressed! Apologies for not having a better historical understanding of the routes – I’m still working my way through the transittoronto archives, and it takes a few repetitions hearing everything before things start to stick. Are there any books on the subject that might help? I haven’t seen any “definitive guides to Toronto transit history” mentioned, though as you know I could stand to do more research. Steve: There are books, but they are all out of print. Bromley’s Fifty Years of Progressive Transit covers the first 50 years of the TTC, and includes track maps. Toronto Public Library has some reference copies. Bromley’s TTC ’28 covers TTC routes in 1928, and apparently can be signed out. Steve: I also refer to the two histories by Louis H. Pursley on the TRC (Street Railways of Toronto), TTC (The Toronto Trolley Car Story), and the TSR (Rails From The Junction). No, it’s not. Thank you for making me late for work (I did not allow extra time for detoured buses because of what you said) in your attempt to make it look like streetcar track construction does not take most of the year as it does. Or may be it was not a deliberate attempt to mislead on your part in which case how about you check your facts before publishing them online? Can I have half an hour’s lost pay or at least can I have my token back? Steve: Carlton cars were back on the regular route this morning, and the Spadina buses stopped detouring via Bathurst and Beverley/St. George. When were you travelling? This had nothing to do with an attempt to make streetcar track construction look like a shorter event. The TTC said it would resume regular routings this morning, and that’s what I published. Looking at vehicles on NextBus, that’s where they were going as of about 8:30 am. I rode through the intersection this evening around 6:30 and both Carlton and Spadina were on their standard routes. Although Carlton/College isn’t set to receive the new Flexitys for some time, I am wondering why the new platforms were built without provisions for ticketing? Steve: Hmmm … I will have to (a) look closely at the platforms, and (b) inquire of TTC. Definitely the plan is to move to all-door loading with Presto on all streetcar routes by year-end 2015. Left hand, right hand?